Laparoscopic partial nephrectomy is emerging as a viable treatment option for select patients who are deemed candidates for nephron-sparing surgery. The laparoscopic option was initially reserved for patients with small, superficial and exophytic tumors. However, with increasing skill and experience, certain centers in the world are now applying laparoscopy to the management of larger and deeper renal tumors. 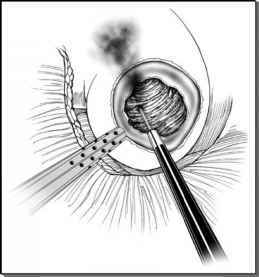 A clear bloodless field during laparoscopic partial nephrectomy is a pre-requisite for a successful procedure. This allows for optimal visualization of tumor margins as well as tumor depth during resections, which are critical in achieving a negative margin. Although transient hilar control achieves this goal admirably, the attendant warm ischemia may be detrimental to the aerobic metabolism of the kidney. Certainly, the effect is deemed to be more permanent if the warm ischemia period exceeds 30 minutes. Hypothermia induces short-term suspension of renal metabolism, which is necessary for cellular protection and for minimizing post-ischemic renal injury. Thus renal hypothermia is necessary in patients in whom the warm ischemia period is estimated to exceed 30 minutes.